Thanks, Greg! I hope anyone else seeing this will comment about where domestic jicama can be found in their area. Amy, it's amazing to see how wine changes with foods! I always share my recipes and unless there's a commercial reason, I don't know why anyone wouldn't. It's always been sort of "I've got something and you can't have it" and that seems odd to me. Also, I applaud you for only eating local and organic. We have a wonderful organic market and I shop there first, then to the local farmers market and finally the grocery store. My meat is usually local and organic and my eggs are always free range as well. I will admit to an occasional pork tenderloin package from Costco. Maureen, thank you for your comment! I'm starting to think going with the "cute" name as a post title was a bad idea. :-( I'm afraid few people are going to look at it. Enjoy that occasional pork tenderloin from Costco. I don't think any of us can live up to our food ideals 100% of the time. Please don't let "water issues" stop you from eating almonds. You are probably eating last years crop anyway. By last years, I mean 2013.As an Almond farmer, we use our water as frugally as we can and not only because of the cost of the electric bill. Thanks, Barbara. Almonds certainly have many health benefits as well as culinary benefits! Chicken and cornflake..this is a completely new combo for me. I would love to try this with jicama. This looks like a lovely chicken salad... the only one the Great Scot will eat warm, thus far, is a chicken, tart apple, cheddar and bacon chicken salad that is sooo heart healthy I'll only make it once a year, lol. Recipe sharing? Yes, always yes. Thank you, whiteangel. I was afraid people wouldn't be able to get past the odd name! 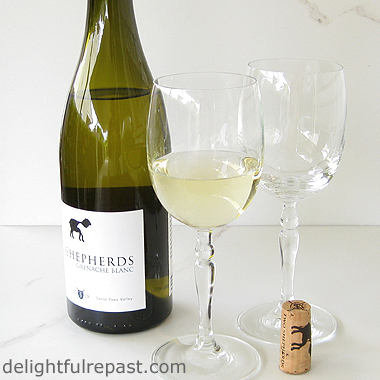 William Allen makes some fine wines at Two Shepherds. He's local up here in Sonoma County. I'll make the chicky salad with cornflakes for my wife since she likes that kind of thing. Cornflakes sure adds a new twist! Thanks, Richard! Do let me know how it turns out and how she likes it! Mmmm... now this sounds very delicious, dear Jean. My husband and son would love this recipe so hopefully I can make it in the next week or two :) Thank you so much for sharing with Roses of Inspiration. I love that your husband is the one that named the dish. Hugs! I love all kinds of white wine, Looks like this wine is good combo with some spicy samosa. I will try it, Your chicken dish with cornflakes looks yumm. Thanks for sharing with Hearth and soul blog hop. pinning, tweeting. and featuring on this week hop. Looks delicious thanks for sharing with Hearth and soul blog hop. pinning tweeting and featuring on this week's hop/. Swathi, you're soooo right -- this wine would be perfect with samosa! Thank you so much, Swathi. Much appreciated! I am sure your husband is so glad you love to cook and bake! A chef in the house is always rewarding. What a lovely, comforting dish, Jean! 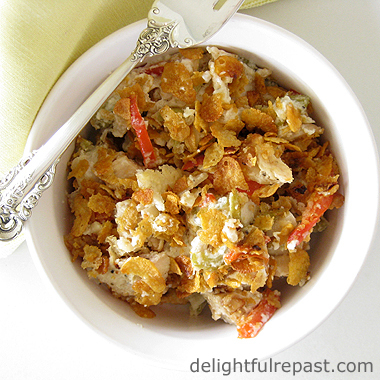 Your Chicken with Cornflakes looks so good. 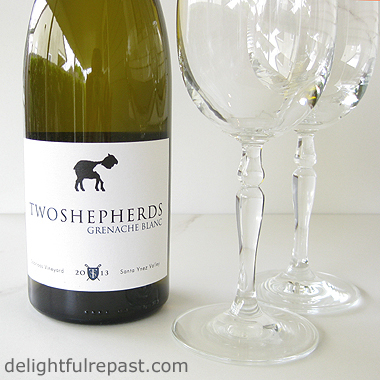 My husband and I love wine and this Grenache Blanc sounds lovely. I always enjoy doing food and wine pairings - the food enhances the wine and the wine enhances the food :-) I've pinned and will tweet your post. Thank you for being a part of the Hearth and Soul hop. Thanks, Bernideen. He *does* love to eat. And I'm fortunate that he is also appreciative. April, thank you so much. Your support is much appreciated.